The Road to Beautiful Website Images Starts Here! 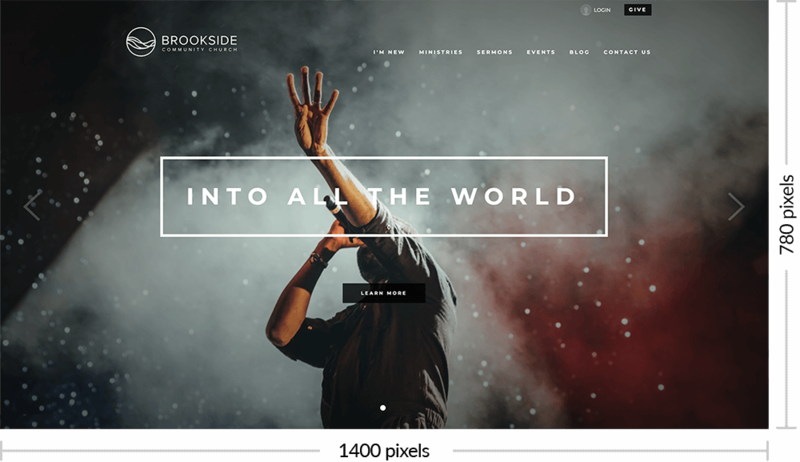 The good news is we've already done most of the work by providing you with a growing list of high quality church website designs to choose from. But if your as picky about design as we are, and you have some graphics know-how, you'll want to optimize your images to keep your site looking snazzy. We've written this article to help! They always say, "You never get a second chance to make a first impression!" That's why, out of all the images on your site, the homepage images are the most important. All of your homepage background images should be 1400 wide by 780 pixels high. Try to compress the file size to somewhere between 150-250kb if possible. All secondary pages have background images behind the header. To optimize those images, you will want to export your photos to 1400 pixels wide by 510 pixels high. Try to compress the file size to somewhere between 115-200 kb if possible. When you upload an image for an event, sermon or blog, our system automatically optimizes (resizes) your image to be displayed in two locations: 1. The page that lists all of the events, sermons or blog posts, and 2. the individual details page for each event, sermon or blog. Two make things easy, all you need to do is upload an image that is around 1000 pixels wide and 560 pixels tall. Try to compress the file size to somewhere between 115-200 kb if possible.